In its first glimpse of the heavens following the successful December 1999 servicing mission, NASA’s Hubble Space Telescope has captured a majestic view of a planetary nebula, the glowing remains of a dying, Sun-like star. 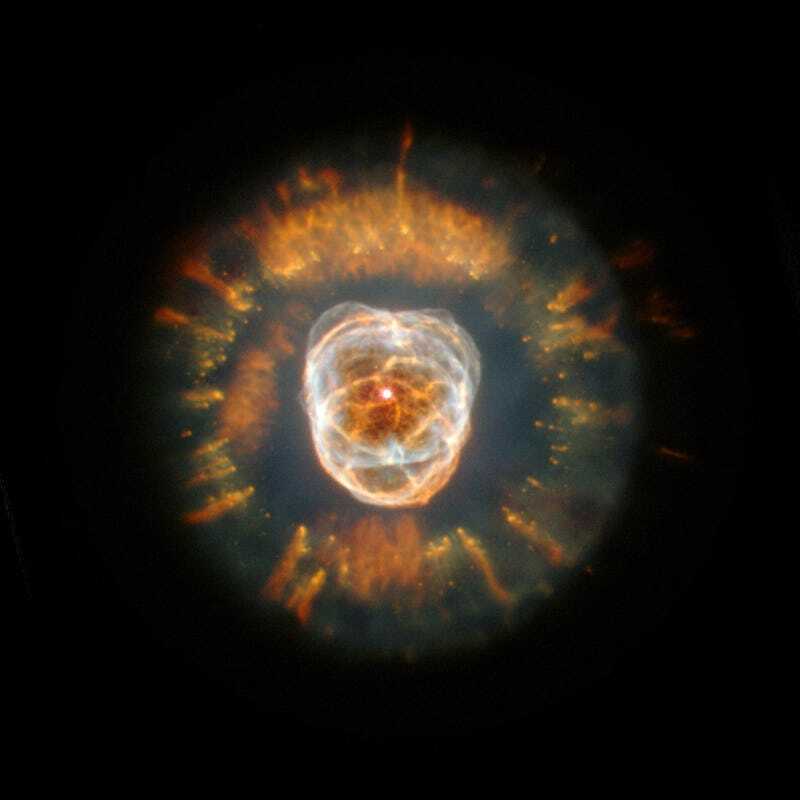 This stellar relic, first spied by William Herschel in 1787, is nicknamed the “Eskimo” Nebula (NGC 2392) because, when viewed through ground-based telescopes, it resembles a face surrounded by a fur parka. In this Hubble telescope image, the “parka” is really a disk of material embellished with a ring of comet-shaped objects, with their tails streaming away from the central, dying star. The Eskimo’s “face” also contains some fascinating details. Although this bright central region resembles a ball of twine, it is, in reality, a bubble of material being blown into space by the central star’s intense “wind” of high-speed material. Scientists believe that a ring of dense material around the star’s equator, ejected during its red giant phase, created the nebula’s shape. This dense waist of material is plodding along at 72,000 miles per hour (115,000 kilometers per hour), preventing high-velocity stellar winds from pushing matter along the equator. Instead, the 900,000-mile-per-hour (1.5-million-kilometer-per-hour) winds are sweeping the material above and below the star, creating the elongated bubbles. The bubbles are not smooth like balloons but have filaments of denser matter. Each bubble is about 1 light-year long and about half a light-year wide. Scientists are still puzzled about the origin of the comet-shaped features in the “parka.” One possible explanation is that these objects formed from a collision of slow- and fast-moving gases. The Eskimo Nebula is about 5,000 light-years from Earth in the constellation Gemini. The picture was taken Jan. 10 and 11, 2000, with the Wide Field and Planetary Camera 2. The nebula’s glowing gases produce the colors in this image: nitrogen (red), hydrogen (green), oxygen (blue), and helium (violet).